Our services are used by a lot of major companies within Kent, some requiring specialist flooring, for example hospitals and factories. 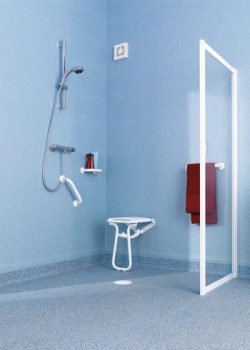 We work a lot with safety flooring, in particular wet rooms, for local residential homes and homes for people with disabilities. We provide and fit the countries leading Commercial flooring materials from suppliers such as, Altro, Tarkett, Polyflor and Flotex. You can trust on Romney Flooring having the correct solutions for your Commercial Flooring requirements. Some of our most prominent customers include Smiths Medical, Dungeness Power Station, Shepway District Council and Ashford Borough Council. If you would like us to quote on any of your requirements please Call on 01797 364610 or email to discuss your commercial requirements.